Eco-friendly paints are products which contains low or no VOCs, contains no lead or mercury, fungicides or pesticides or any other harmful ingredients like formaldehyde. Even though some companies claim that the products are ‘eco-friendly’, they still contain VOC Solvents, chemical pigments and fungicides, making it not so environmently friendly. Technically, there are no clear definition to this term in the industry. There are however clearer indications of what is better to use if you take the environment and your health into consideration. These would be plant-based, water-borne paints, plant-based paints with natural solvents, water-based paints with low or no VOCs, amongst others. There are also a long list of ingredients in paint to avoid, things like mercury, lead, titatnium dioxide to name just a few. VOC’s can still emit toxicity up to five years after you have painted the area. Studies show that one liter of paint can result in up to 30 liters of toxic waste. Eco-friendly paints are becoming more accessible on the market today and where they once had a limited range in colours, they have vastly expanded that range. They are a bit more expensive than your conventional paints, but compared to your health and the environment, it is a rather small price to pay. Eco-friendly paints can be applied the same way of ordinary paints, with similar coverage. They are naturally not only a great choice for your home, but especially painting nurseries and your childrens rooms as well as for painting their toys. They are available in the same types of finishes as ordinary paints, as well as emulsions, primers and various other finishes. 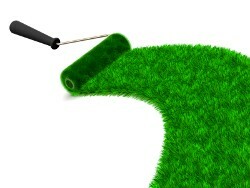 There are no problems concerning the performance of eco-friendly paints compared to ordinary paints. At PROPAINT we care about the environment and our clients. So for this very reason, we have incorporated using a range of eco-friendly products to our existing list of products at PROPAINT Painting & Renovations.